The shape and the decorative motifs of this finely potted stem cup are characteristic of the late fifteenth and early sixteenth centuries. The interior is decorated with two incised dragons chasing flaming pearls around the cavetto and covered with colorless glaze. At the center is an incised double circle containing three stylized ruyi-shaped clouds. The exterior has two five-clawed dragons slip-trailed onto the surface, chasing flaming pearls among clouds. A ring of eleven lotus lappets encircles the cup just above the foot. Around the base of the foot is a classic scroll bounded by parallel lines. While the green enamel that highlights the high relief designs is uniform in tonality, the yellow enamel background has a mottled appearance. 1. Margaret Medley, The Chinese Potter, New York, 1976, fig. 154. 2. Medley 1976, 207-208, fig. 155; see also Suzanne Valenstein, Ming Porcelains: A Retrospective [Exh. cat. China Institute Gallery, China Institute in America, New York], New York, 1970, pl. 22. 3. Compare Valenstein 1970, pl. 38. 4. On 'Phagspa, see David Snellgrove, A Cultural History of Tibet, New York, 1968, 169; and Herbert Franke, "Tibetans in Yüan China," in John D. Langlois, Jr., ed., China under Mongol Rule, Princeton, 1981, 304-322. 5. Previously published in R. L. Hobson, "Chinese Porcelain Fragments from Aidhab and Some Bashpa [sic] Inscriptions," Transactions of the Oriental Ceramic Society 6 (1926-1927), pl. 6, fig. 2. 6. John Alexander Pope, Esin Atil, and Josephine H. Knapp, Oriental Ceramics: The World's Great Collections. The Freer Gallery, Tokyo, 1975, 9: pl. 109 (where the mark is incorrectly recorded as the phonetic equivalent of "Zhengde nian zhi"). 7. See Lienche Tu Fang, "Chu Hou-tsung," in L. C. Goodrich and Chaoying Fang, eds., Dictionary of Ming Biography, 2 vols., New York, 1976, 1: 320-321. This tall, slender vase is a more elegant and attenuated version of the customarily sturdy Ming baluster vase shape.1 It has a striking and lively profile of a continuous flowing curve. The lip is flaring, the neck long and thin. The line of the shoulder slopes to the wide body curve, which narrows gradually to a slim waist and flaring base. 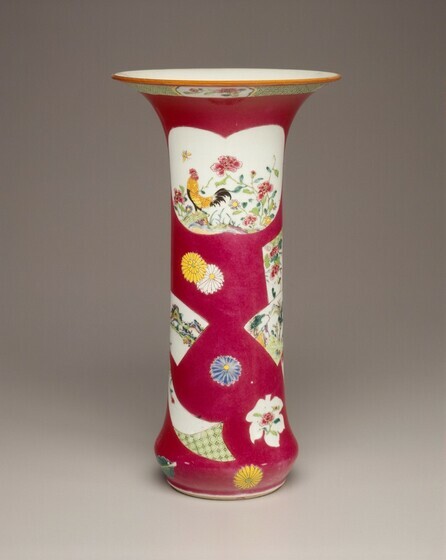 It is interesting to speculate on the possible relationship of this vase to kinran-de (gold-brocaded) porcelain, the Japanese term for the Ming polychrome wares elaborately decorated in gold, which were made in unofficial kilns especially for Japanese demand. There is a marked difference between this vase, with its simple naturalistic design, and the typical kinran-de ware, with its lavish decoration of close patterns combining gold with overglaze colored enamels. There is, however, a definite link to the blue monochromes and to the "mirror black" monochromes of the Kangxi period, both types that were decorated with overglaze gold painted designs. There are examples of this same general shape but of heavier appearance dating from as early as the fifteenth century. 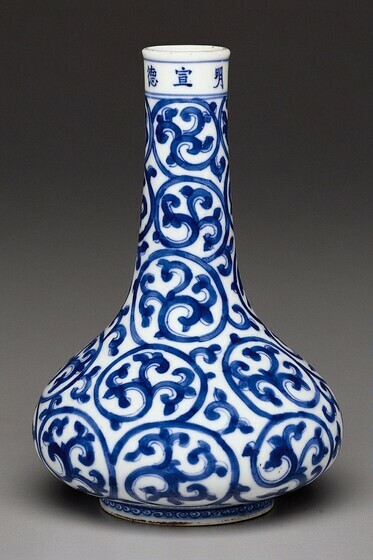 Wares of this type are thought to be products of unofficial kilns, which assumed growing importance in the last part of the Ming dynasty as a result of weak imperial patronage. 1. Some Ming examples are decorated with three-color glazes; R. L. Hobson and A. L. Hetherington, The Art of the Chinese Potter, London, 1923, pl. 129. There is a three-color vase of somewhat the same form, with similar dragon handles, in the collection of the Compagnie de la Chine et des Indes, Paris. Cécile Beurdeley and Michel Beurdeley, A Connoisseur's Guide to Chinese Ceramics, New York, 1974, 205, pl. 105. 2. In bronze: Freer Gallery of Art, acc. no. 57.22. Reproduced in The Freer Collection of Bronzes, vol. 1, Washington, 1967, no. 97, pl. 111, 48, pl. 91 (detail); Art of the Six Dynasties [Exh. cat. China Institute Gallery, China Institute in America, New York], New York, 1975, no. 37, repro. 61. In jade: Thomas Lawton, Chinese Art of the Warring States, Washington, 1982, 154, no. 101. 3. In Tang pottery, dragon handles are found on amphoras, with the animals' jaws closed on the lips of the vases. See, for example, Freer Gallery of Art no. 43.4: Oriental Ceramics, The World's Great Collections, 11 vols. Tokyo and New York, 1980-1982, vol. 9, The Freer Gallery of Art, 1981, fig. 22; Margaret Medley, The Chinese Potter, New York, 1976, 85, fig. 58; Metropolitan Museum of Art, acc. no. 1984.483.3: Suzanne Valenstein, A Handbook of Chinese Ceramics in the Metropolitan Museum of Art, rev. ed. New York, 1989, 66, fig. 58. 4. R. L. Hobson (Chinese Pottery and Porcelain, London, 1915, 2: 102) believes that the process included a second firing at low temperature in the muffle kiln in the same way as that required by overglaze lead enamel. He also refers to the description of the gilding process in Tao Shuo (Description of Pottery) by Zhu Wan, published in 1774, saying, "Gold leaf combined with one tenth by weight of carbonate of lead was mixed with gum and painted on with a brush." A footnote says that Jingdezhen Taolu (An Account of Pottery at Jingdezhen), 1815, in book 9, fol. 17, verso, quotes a method considered infallible for fixing the gold by adding garlic juice to the gold mix before painting and firing. Soame Jenyns, (Later Chinese Porcelain: The Ch'ing Dynasty, 1644-1912, 2d ed., London, 1959, 84) speaks of "black oil gilding," and other writers have written of "oily" adhesives. It may be that some kind of oil was part of the adhesive formula for gold. Valenstein 1989, 168, mentions that gilding in Ming was a legacy from the Yuan period. 5. 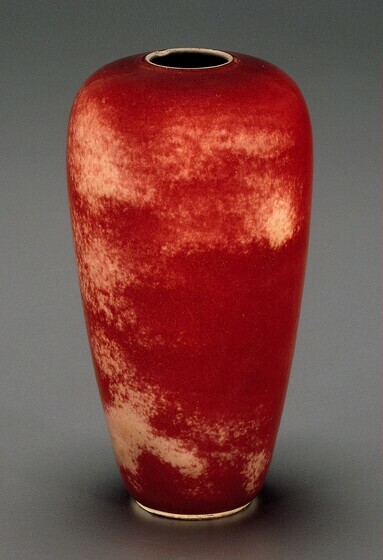 Frances Klapthor, Chinese Ceramics from the Collection of the Baltimore Museum of Art, Baltimore, 1993, 47, no. 35. Some scholars suggest that the smooth-skinned, three-clawed, single-horned, fork-tailed relief dragons on these celadon vases more closely resemble the archaistic chi dragons often seen on Song and Yuan porcelains than the scaly-skinned, five-clawed, two-horned, long dragon, which is more typical of Qing wares.5 However, these creatures are generally described as haishui (ocean) long, rather than chi, in Chinese captions to vases of this type, while chi seems to be reserved for a more serpentine creature with a much smaller head.6 In any case, the National Gallery's original curatorial notes describe the creatures as "archaistic dragon forms," and of that there is little doubt. Although the Qianlong reign is more generally associated with antiquarianism than that of Kangxi, a taste for the antique was common among China's educated elite at least from the Song dynasty onward, and it is likely that they were the intended audience for this piece. 1. Ralph M. Chait, "The Eight Prescribed Peachbloom Shapes Bearing Kang-hsi Marks," Oriental Art 3 (Winter 1957), 130-137. "Three-string vase" is a direct translation of the Chinese san xian ping, and Chait explains that the Chinese likened the ridges to the strings of musical instruments. He also mentions that this form is sometimes described by the Chinese as "turnip-shaped." See, for example, Yihua Li, ed., Kangxi Yongzheng, Qianlong Qing Porcelain from the Palace Museum Collection, Hong Kong; Beijing, 1989, 146-147, no. 129, repro. ; and Ho-pi Tsai, ed., Catalogue of the Special Exhibition of Kang-hsi, Yung-cheng and Chien-ling Porcelain Ware from the Ching Dynasty in the National Palace Museum [Exh. cat. National Palace Museum], Taipei, 1986, 41, no. 13, repro. This word can also be used to refer to a radish; see Keyang Yang, ed., Taoci, 3 vols., Shanghai, 1988, vol. 3, 56, no. 157, 135, repro. 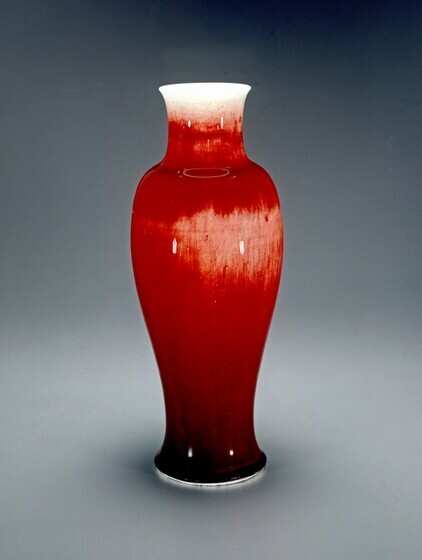 Yang indicates that either laifu and luobo (the word generally used for radish, usually meaning the red, but also sometimes including the white variety) is an acceptable descriptive term for the shape of this vase. Though Chait professes puzzlement at this appellation, it does not seem too remote if the vegetable and vessel are both considered in profile. 2. Among the few other decorated monochromes in the National Gallery collection are the celadon and peachbloom vases with molded petal bands (1942.9.499, 500, 511-513, 521), three white vessels (1942.9.548-550), and a white porcelain bowl (1942.9.551) with incised patterns. 3. Mary Gardner Neill, ed., The Communion of Scholars: Chinese Art at Yale, New York, 1982, 82-83, no. 35, repro. 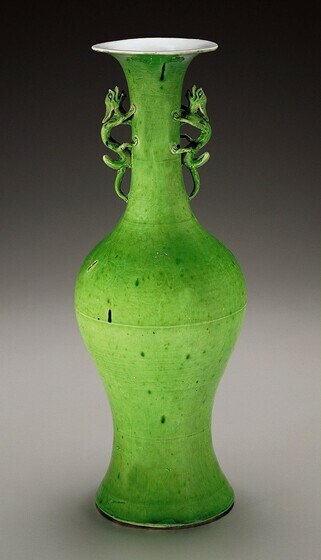 ; René-Yvon Lefebvre d'Argencé, Chinese Ceramics in the Avery Brundage Collection, San Francisco, 1967, 138-139, pl. 64C (my thanks to Clarence F. Shangraw for the information that the clair de lune identification of this vase in the catalogue was an error and that this is in fact a typical celadon example); Stephen W. Bushell, Oriental Ceramic Art: Collection of W. T. Walters, New York, 1980, color pl. 7, for the example in the Walters Art Gallery; Li 1989, 146-147, no. 129, repro. ; The Tsui Museum of Art (Hong Kong, 1991), no. 124, repro. 4. Suzanne Valenstein, A Handbook of Chinese Ceramics in the Metropolitan Museum of Art, New York, 1989, 220, no. 211, repro., and color pl. 36. 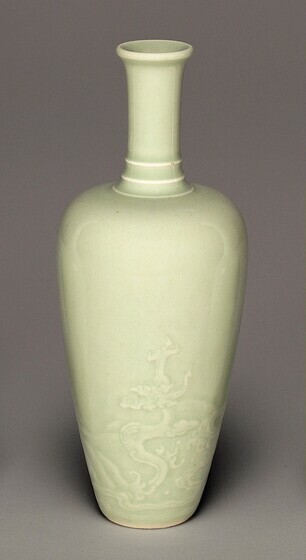 Other Kangxi-marked or -attributed celadon vases exist with carved or incised dragons that occupy a larger portion of the vase body. Though sharing the same oviform profile, they may have only one or no ridges on their necks, and thus differ from the classic "three-string" form. 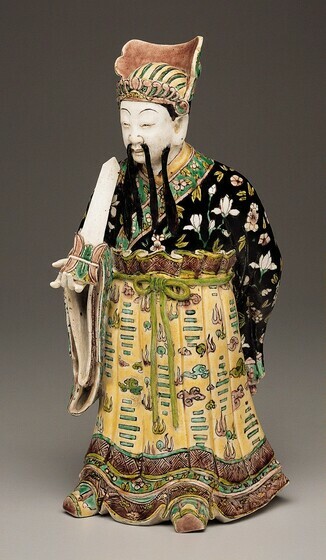 These include an example in the British Museum, London: Soame Jenyns, Later Chinese Porcelain: The Ching Dynasty, 1644-1912, New York, 1951, pl. 40; the Taft Museum, Cincinnati: Sheila Keppel, China in 1700: Kangxi Porcelains at the Taft Museum [Exh. cat. The Taft Museum, Cincinnati], Cincinnati, 1988, 22, no. 12, 21, repro. ; and the Baur Collection, Geneva: John Ayers, The Baur Collection, Geneva: Chinese Ceramics, 4 vols., Geneva, 1968-1974, vol. 3, A358. 5. Louisa Cunningham, in describing the Yale piece, links the dragons on that vessel to Song-dynasty chi dragons: see Neill 1982, 82. There is an extensive bibliography available on dragons in Chinese art. See Jessica Rawson, Chinese Ornament: The Lotus and the Dragon, London, 1984, 93-98; and Xin Yang, Yihua Li, and Naixiang Xu, The Art of the Dragon, Boston, 1988. The best discussion of dragon types, especially chi and long, can be found in Jan Wirgin, Song Ceramic Designs, London, 1979, 186-190. 6. Yang 1988, 3: 56, 135, no. 157, repro. ; and Li 1989, 146-147, 129, repro. Both use haishui long: Li 1989, 164, no. 147, reproduces a yellow glazed cup with what are specifically called chi dragons, and they are quite different from the dragons on this vase, being small-headed with short bodies. 7. Louise Allison Cort, Jan Stuart, and Laurence Chi-sing Tam, Joined Colors: Decoration and Meaning in Chinese Porcelain [Exh. cat. Arthur M. Sackler Gallery, Smithsonian Institution], Washington, 1993, 40. Stuart makes the connection with Chen Rong. 8. Yang 1988, 3: 56, 135, no. 157, repro. This vase has a globular body and a slightly flaring neck. The proportions are very close to larger examples that bear Qianlong reignmarks, suggesting that this vessel dates to the same period.1 The exterior is decorated with designs incised under the glaze. Six ascending leaves surround the neck, the bottom of which is encircled by a key-fret band. The swelling body has a floral scroll with three large petals. Above the foot-ring is a band of stylized petals. 1. René-Yvon Lefebvre d'Argencé, Chinese Ceramics in the Avery Brundage Collection, San Francisco, 1967, pl. 75. The tall, slender shape of this baluster vase is quite restrained. The mouth turns outward only slightly; the neck is short, the shoulder sloping.1 Wheel-thrown, the vase still carries, on the inside, the grooves, or "throwing rings," made by the potters' fingers as the clay took shape. The porcelain is fine-textured, white, and smooth where it is revealed on the carefully beveled foot-ring. A transparent, pale greenish glaze covers the inside and the base. On the outside, the dark red of the glaze drains away from the lip and streaks down the sides from the shoulder, becoming very deep in color on the lower half of the vessel. The glaze collects just at the bevel of the foot in a thick, perfectly controlled welt. On one side of the body there is a lighter streaked area. These color variations give the piece a lively individuality. At some time in its recent history, an unknown connoisseur aptly named this vase "The Flame. "2 Although large langyao vases were not marked with the reign name or other marks on the base, all the characteristics of form and glaze described here indicate that this vase was made in the Kangxi period.3 Like all Kangxi glazes of the dark copper-red type, this one has a glossy surface with very small bubbles. It is because of the transparency and depth of the glaze that the bubbles create a sparkling effect. 1. A vase in the British Museum is very similar in size and shape; Soame Jenyns, Later Chinese Porcelain: The Ch'ing Dynasty, 1644-1912, New York, 1951, pl. 7, fig. 2. 2. Catalogue of the Morgan Collection of Chinese Porcelains; privately printed by order of Mr. J. Pierpont Morgan, 2 vols., New York, 1904-1911, 2: no. 1352, states "known in China and the Occident as the Flame." 3. Clarence Shangraw furnishes the information that unmarked langyao was not made at the imperial kilns, which under the supervision of Lang Tingji produced only wares with the Kangxi mark. The exterior of this classical peachbloom vessel is covered with a dull red glaze. There are several small patches of pale green color. This is one of the eight peachbloom shapes traditional for the scholar's desk, many of which can be found in English and American peachbloom collections.1 The form and size are remarkably uniform in all examples. The eight in the National Gallery collection, for example, have nearly identical dimensions. Small, low, and rounded, with a slightly flattened top, the boxes have covers and receptacles of almost equal size. 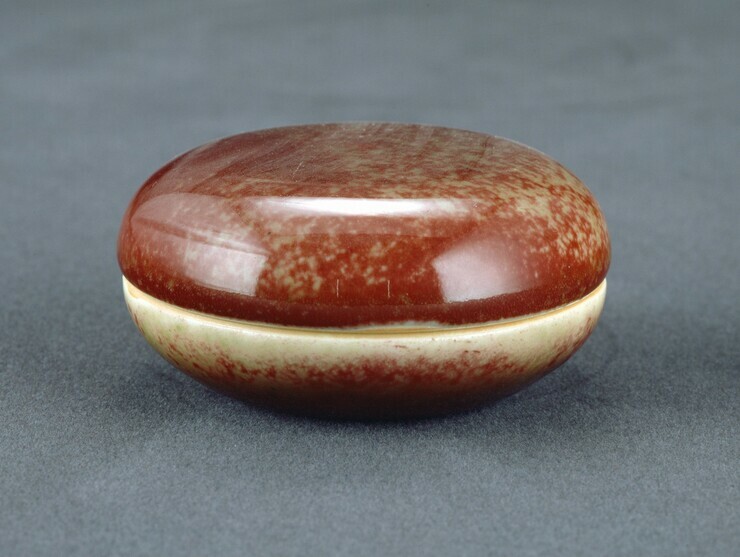 The lower part, which held the vermilion red paste used for seals, has an inner flange, inset and unglazed to ensure the secure fit of the cover. The smoothness of the white porcelain showing on the cleanly trimmed, low narrow foot is typical of the refinement of this ware.2 The base is slightly recessed and concave. On each of these boxes, the peachbloom glaze stops at the closing edge of the cover and at the foot. A colorless glaze is used on the inside and the base. Among a group of boxes of superior quality and condition, the principal variable is the fortuitous effect of color and its distribution. The velvety surface of 1942.9.506 is richly mottled with dark red on the cover. The peachbloom glaze is paler on the lower section, becoming very light green at the closing edge. 1. Ralph M Chait, "The Eight Prescribed Peachbloom Shapes Bearing Kang-hsi Marks," Oriental Art 3 (Winter 1957), 130-137, repro., 137. Among them are Freer Gallery of Art, Washington, acc. no. 43.5, and Metropolitan Museum of Art, New York, bequest of Benjamin Altman, no. 14.40.369: Suzanne Valenstein, "Highlights of Chinese Ceramics," Metropolitan Museum of Art Bulletin 33, no. 3 (1975), no. 7, pl. 138; also Valenstein 1975, pl. 35 (color). Two were formerly in the Edward T. Chow collection, Geneva, one of which is illustrated in the sale catalogue of that collection: Sothebys, Hong Kong, 19 May 1981, 98, no. 496. The Baur Collection, Geneva, has three: John Ayers, The Baur Collection, Geneva: Chinese Ceramics, 4 vols., Geneva, 1968-1974, vol. 3, nos. A304, A308, and A312. Yale has one in the Moore collection: George J. Lee, Selected Far Eastern Art in the Yale University Art Gallery, New Haven, 1970, 176, no. 352. For others, see International Exhibition of Chinese Art [Exh. cat. Royal Academy of Art, London], London, 1935-1936, no. 2675; Monochrome Porcelain of the Ming and Manchu Dynasties [Exh. cat. Oriental Ceramic Society, London], London, 1948, which includes ten pieces; and "Catalogue of the Exhibition of Monochrome Porcelain of the Ming and Manchu Dynasties," Transactions of the Oriental Ceramic Society: 1948-1949 24 (1951), 48-61, no. 346. 2. On all the peachbloom shapes, there is a slight demarcation of the foot shown by a delicate trimming line in the paste. 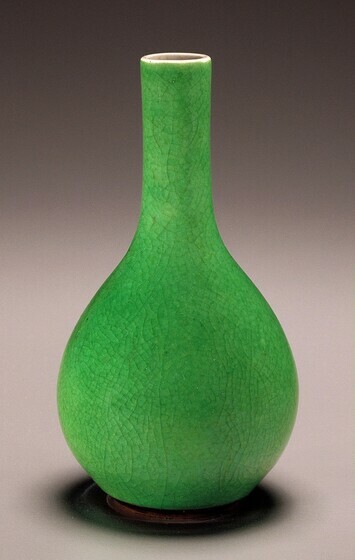 This striking pear-shaped vase is one of the most beautiful apple-green vessels in the National Gallery collection, despite the pinhole on its neck. 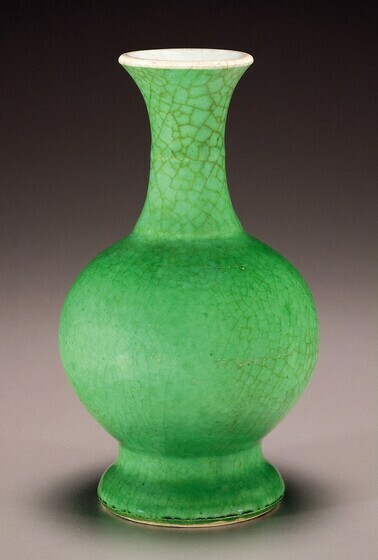 Its graceful profile coupled with its brilliant emerald green surface distinguish it from the two more squared-off and pale bottle vases in the collection (1942.9.537 and 1942.9.542), and relate it more closely to the third, 1942.9.535, whose glaze is darker than that seen here. Yet the treatment of the foot and the unstained crackle link all four pieces and indicate that this vessel was manufactured relatively early, if not as early as the other three vases. 1. Of importance for the dating of this piece is a monochrome red-glazed "gall-bladder-shaped vase" (dan ping) with a Yongzheng reignmark in the National Palace Museum, Taipei, which is extremely close in shape to this vase. See Teresa Ts'ao, Catalogue of a Special Exhibition of Ch'ing Dynasty Monochrome Porcelains in the National Palace Museum [Exh. cat. National Palace Museum], Taipei, 1981, 43, no. 10, repro. See also the marked Yongzheng monochrome robin's-egg-blue vase of the same shape: Ts'ao 1981, 95, no. 42, repro. The shape is also encountered in polychrome wares; for a marked Qianlong famille rose example, see Ho-pi Tsai, ed., Catalogue of the Special Exhibition of K'ang-hsi, Yung-cheng and Ch'ien-ling Porcelain Ware from the Ch'ing Dynasty in the National Palace Museum [Exh. cat. National Palace Museum], Taipei, 1986, 92, no. 75, repro. 2. "Catalogue of the Exhibition of Monochrome Porcelain of the Ming and Manchu Dynasties," Transactions of the Oriental Ceramic Society: 1948-1949 24 (1951), 58, no. 154, pl. 27, bottom row. The exhibition was held in 1948. 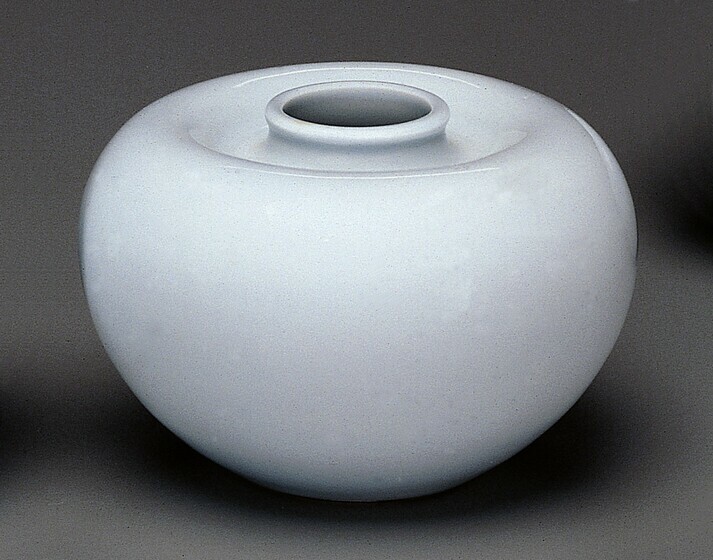 The shape of this vase, with its three distinct segments, differs from the fluid and elegant forms most often seen in Kangxi- and Yongzheng-period monochromes as exemplified by those so marked and/or attributed in the National Gallery collection, whether delicate peachbloom, celadon, pale blue, or more sturdy oxblood vases. None of the National Gallery's vases exhibits this characteristic. Indeed, this shape seems more typical of those seen in later eighteenth- and nineteenth-century Chinese ceramics, which accounts for its dating. 1. "Catalogue of the Exhibition of Monochrome Porcelain of the Ming and Manchu Dynasties," Transactions of the Oriental Ceramic Society: 1948-1949 24 (1951), 58, no. 145, pl. 27, top row. 2. The Edward T. Chow Collection Part One: Catalogue of Ming and Qing Porcelain, sale, Sothebys, New York, 25 November 1980, 101, lot 84, repro. 3. Teresa Ts'ao, Catalogue of a Special Exhibition of Ch'ing Dynasty Monochrome Porcelains in the National Palace Museum [Exh. cat. National Palace Museum], Taipei, 1981, 83, no. 35, repro. Pale blue glaze appears to have been more broadly used during the Kangxi and Yongzheng reigns than peachbloom and was applied to a wide variety of vase shapes rather than to only eight types. Nevertheless, certain forms are found in both glazes,3 among them the gong-shaped brush washer, the "amphora" vase, and the water pot. 1. On the use of such water pots, see Chu-Tsing Li and James C. Y. Watt, eds., The Chinese Scholar's Studio: Artistic Life in the Late Ming Period: An Exhibition from the Shanghai Museum [Exh. cat. The Asia Society Gallery, New York], 1987, 167, no. 39, repro. The Arts of the Ch'ing Dynasty [Exh. cat. The Arts Council Gallery, London], 1964, 67, no. 266, pl. 90, calls this form a brush pot of globular shape. 2. Suzannne Valenstein, A Handbook of Chinese Ceramics in the Metropolitan Museum of Art, rev. ed. New York, 1989, 239, no. 240, repro. ; George J. Lee, Selected Far Eastern Art in the Yale University Art Gallery, New Haven, 1970, no. 342, repro. ; John Ayers, The Baur Collection, Geneva: Chinese Ceramics, Geneva, 1972, vol. 3, A319, repro. 3. Ralph M. Chait, "The Eight Prescribed Peachbloom Shapes Bearing Kang-hsi Marks," Oriental Art 3 (Winter 1957), 130, is the primary source for the claim that only eight types of vessels, which he calls "prescribed," were produced in the peachbloom glaze, and this view is widely accepted. Chait, however, acknowledges that there is no textual evidence for this opinion. It rather represents what a Chinese adviser informed him was an accepted opinion among Chinese connoisseurs at the time his article was written. 4. Research has thus far failed to uncover any published pale blue water pots without necks, but it would be premature to claim they were not manufactured. In addition to the example donated by Edwin C. Vogel, the Metropolitan Museum of Art, New York, has two pale blue water pots donated by Michael Friedsam, 32.100.435 and 436. The former lacks a neck, but it is not certain if this is its original state. At least two pale blue "beehive" water pots attributed to the Kangxi period can be cited, one in the collection of August Warnecke, Hamburg: see P. W. Meister, China Porzellan: Sammlung A. Warnecke, Hamburg, 1978, 16, 023, repro. The other is in the collection of the University Museum, Philadelphia, acc. no. 88-10-13, collection of Dr. Frank Crozer Knowles. Peachbloom "beehive" water pots are more common than pale blue, and the National Gallery has several. Rather rare are yellow examples, of which the National Gallery has one, 1942.9.502. 5. Chait 1957, 137; Valenstein, 1989, no. 241. 6. Stephen W. Bushell, Oriental Ceramic Art: Collection of W. T. Walters, New York, 1980, 308. 7. Terese Tse Bartholomew, The Hundred Flowers: Botanical Motifs in Chinese Art [Exh. cat. Asian Art Museum of San Francisco], San Francisco, 1985, no. 32, discusses the symbolism of the pomegranate and reproduces a Yuan pot of said shape with foliate rim. A similar small globular pot dating to the Yongzheng period is in Yihua Li, ed., Kangxi Yongzheng, Qianlong Qing Porcelain from the Palace Museum Collection. Hong Kong; Beijing, 1989, 311, no. 140. "Beehive" water pots are usually seen in peachbloom or sometimes pale blue glaze.1 This one, glazed in a pleasing amber yellow, is a rarity. It is shaped in accordance with the standard prescribed form for such pots. 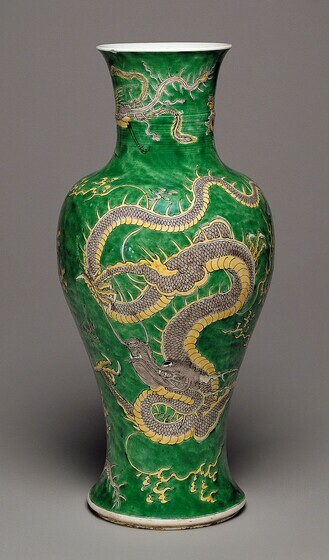 The dragon medallions, incised under the glaze and spaced around the body, are like those on the peachbloom examples in the National Gallery collection (1942.9.514 and 515). 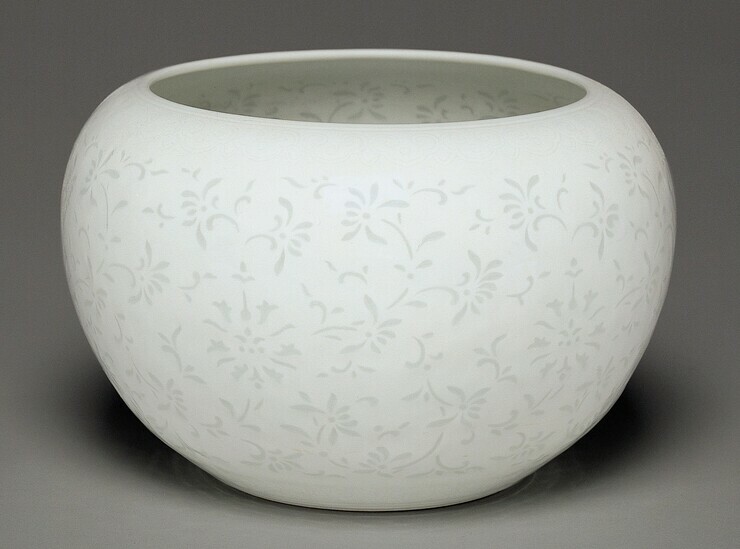 The translucent glaze has a slight iridescence and a barely perceptible fine crackle. It covers the entire vessel, including the foot and base, in contrast to the peachbloom and blue monochromes, which have an exposed biscuit foot and white glazed base. Indeed, a foot-ring that has been glazed over is highly unusual on Chinese porcelains. 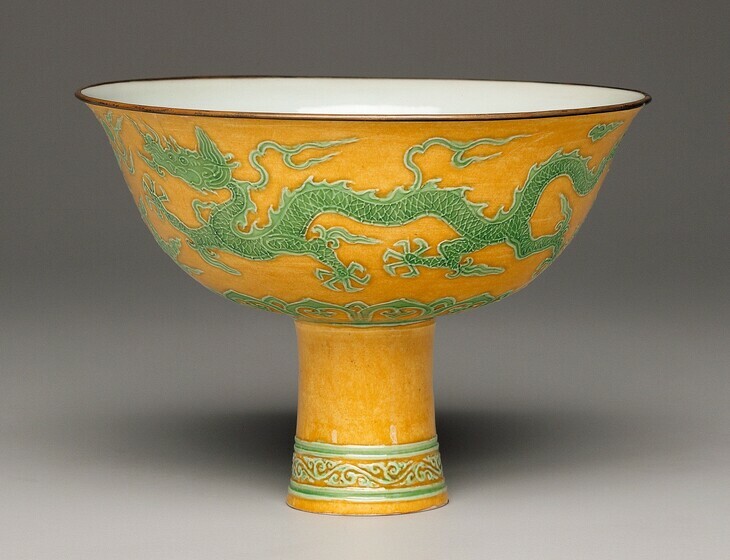 The attractive shade of yellow used here shows a brownish tinge, especially where it has collected in the thickened ring at the base and in the incised lines of the dragon medallions. 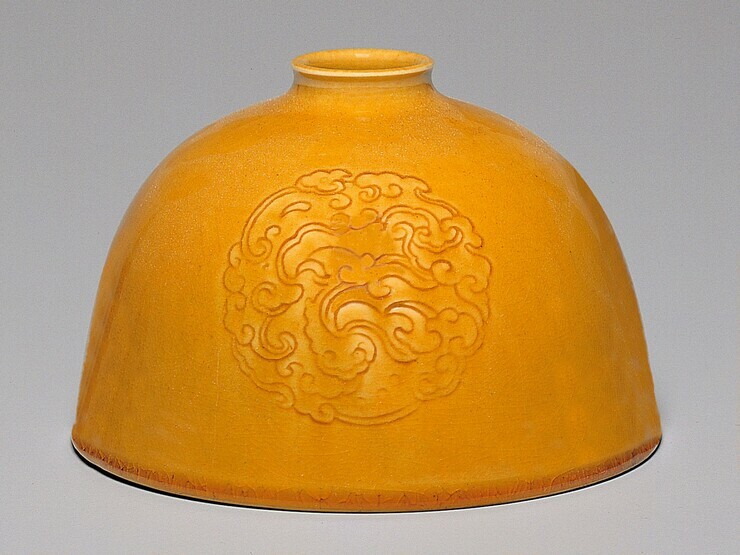 A mustard tone, typical of many Kangxi yellow glazes, is also apparent. 1. One of the eight prescribed shapes, also called taibozun (see Ralph M. Chait, "The Eight Prescribed Peachbloom Shapes Bearing Kang-hsi Marks," Oriental Art 3 [Winter 1957], 137). 2. Fong Chow, conversation with the author of 27 August 1963 (documentation in NGA curatorial files). 3. Acc. no. 14.40.375, from the Altman collection. 4. The change was made and recorded on the Metropolitan Museum of Art's, catalogue card on 21 August 1972 by Suzanne Valenstein. 5. Fu Shen, conversation with the author of 17 March 1992 (documentation in NGA curatorial files). 6. Margaret Medley, Illustrated Catalogue of Ming and Ch'ing Monochromes in the Percival David Foundation of Chinese Art, section 6, London, 1973, 30, no. 508, describes it as having "an uneven yellow enamel applied over a thin feldspathic glaze....The yellow enamel is finely crazed and slightly iridescent." She assigns it to the Kangxi era and gives its diameter as .124 m (4 7/8 in.). 7. He refers specifically to the following publication: Baochang Geng, Ming Qing Ciqi Jianding, Beijing, 1993, 222. This study on copies and fakes concludes that a majority of taibozun were from the late nineteenth or early twentieth century. This elegant vessel has the shape of a Buddhist monk's begging bowl. Floral decoration is pierced through the body in the so-called "rice-grain" technique. The perforations in the body are filled by the colorless glaze. Incised ruyi lappets surround the rim, and two incised horizontal lines and rising flame motifs surround the foot. 1. The technique is very similar to a "rice-grain" dish in the Asian Art Museum, San Francisco, that bears a six-character underglaze blue seal-script mark of the Qianlong period. On the "rice-grain" technique and its history, see Eleanor Hartstone, Rice Grain Porcelain, Boston, 1978. 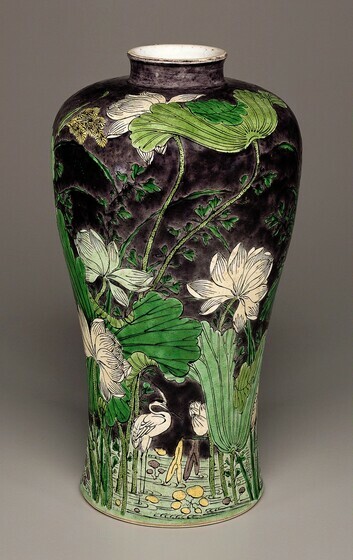 The exterior of the vase is decorated with a depiction of egrets in a lotus pond. The aubergine ground is unusual and suggests that the vase dates from an early phase in the evolution of the famille verte palette, before the green or black backgrounds had come to predominate. Otherwise the enamel colors are the same as those used later (black, yellow, aubergine, and three shades of green, including lime green). The dark texture strokes appear to have been painted over the enamel washes, instead of under the enamels as is more typical. The vase is also unusual in that it represents a rare appearance of the meiping shape in the early Qing dynasty. Following the late-Ming Wanli reign (1570-1620), the meiping occurred only rarely in the seventeenth century. 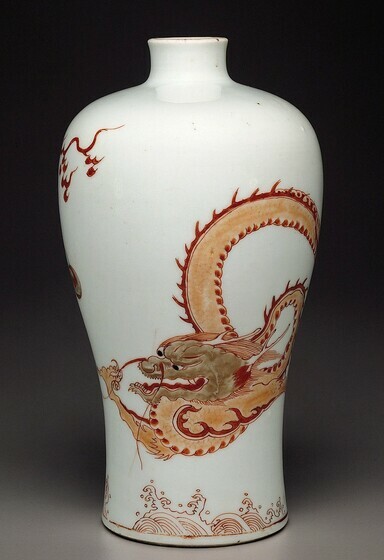 The decoration on this vase consists of two large four-clawed dragons chasing flaming pearls among stylized flames on the main body and two phoenixes on the neck. The enamel palette includes green, yellow, aubergine, and black. The two dragons, one yellow and the other aubergine, are of different types. The aubergine dragon resembles the characteristic late-Ming dragon, with an elongated head. The other has a more typical Kangxi-period head, which is much larger. Around the eyes of the latter, brown lines of the underdrawing are visibly painted directly on the porcelain body. This molded cup is decorated in the famille verte and famille jaune palettes, with yellow, aubergine, and two shades of green enamel. 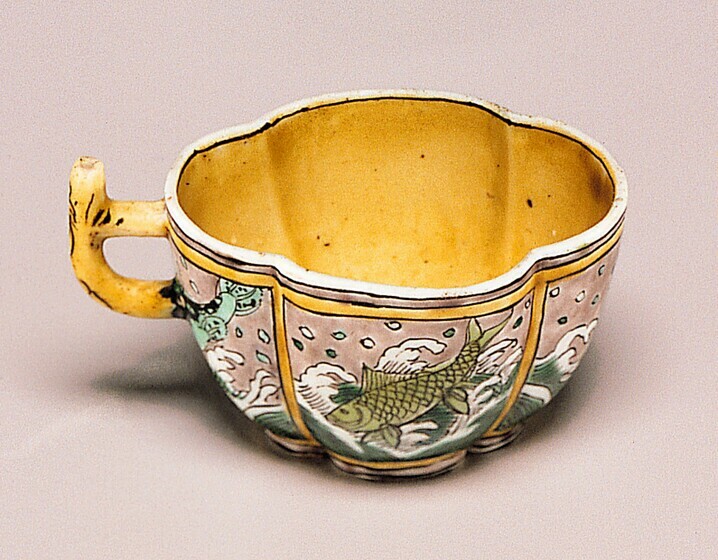 The shape of the bowl of the cup, an oval quatrefoil, decorated with panels of fish among waves, corresponds to its decoratively molded and glazed base. 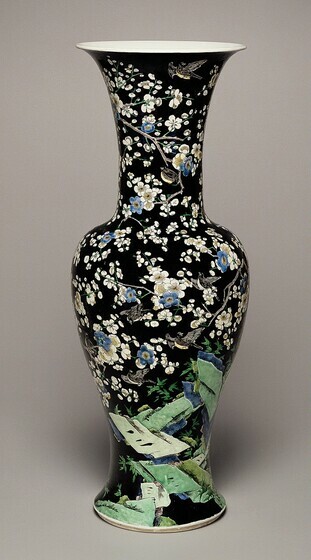 The exterior of this vase is decorated with garden rocks, blossoming plum trees, bamboo, and birds against a black ground. The painting is accomplished but rather perfunctory. The full famille noire palette is employed, with yellow, blue, aubergine, and three shades of green. In the black background areas, a dark green enamel layer is applied directly over a thin, matte brown wash. The figure of Shou Lao may originally have been designed for use on a temple or family altar. 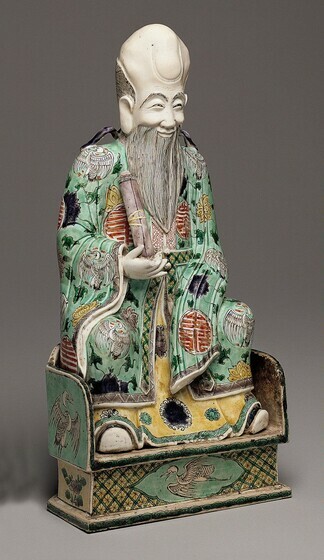 The seated deity is shown in formal court robes and is recognizable by his tall, domed head and long beard.1 He holds a scroll in his right hand. The figure is decorated in the famille verte palette in yellow, red, aubergine, gold, and two shades of green. The light green robe is decorated with red and gold medallions containing a stylized form of the character shou (longevity). Large cranes (symbols of longevity) are visible in the robe and on the front of the throne. The throne back is decorated with flowers on a light green ground and cranes. A yellow and green diaper ground encloses the ogival medallion with flying crane on the front panel of the throne. The corresponding panel on the back depicts two aubergine peaches (symbols of longevity) with green leaves on a yellow ground. 1. For a discussion of Shou Lao in Chinese literature and painting, see Mary H. Fong, "The Iconography of the Popular Gods of Happiness, Emolument, and Longevity," Artibus Asiae 44, 2/3 (1983), 159-199. 2. Edgar Gorer and J. F. Blacker, Chinese Porcelain and Hard Stones, 2 vols., London, 1911, vol. 1, 69. Figures of this type, representing Daoist, Confucian, and Buddhist deities, are a common Kangxi product. This example is decorated on the biscuit with enamels in the famille jaune and famille noire palettes. The standing figure has a high crown and holds a gui scepter (a symbol of official rank) in his right hand. He is dressed in a jacket and a long gown. The jacket is decorated in the famille noire palette with magnolias and plum blossoms, and the gown in the famille jaune palette with clouds, flaming jewels, and stylized hexagrams. The cuffs, collars, and hems are painted with elaborate border and diaper patterns. The enamels include black, yellow, green, and aubergine, and there is additionally a colorless glaze. The crown has a small hole at the top that may originally have held a plume or other decoration. The presence of the crown, gui scepter, and trigrams on the robe indicate that the figure is a deity of the Daoist pantheon, possibly either Wen Chang, the God of Literature, or Lu Xing, the God of Emolument.1 The figurine would likely have originally formed part of a larger group of Daoist deities on a temple or home altar. Many of these figurines have survived from the Kangxi period. In the eighteenth century they became very popular in Europe. 1. On Wen Chang, see E.T.C. Werner, A Dictionary of Chinese Mythology, Shanghai, 1932, 554-558. On Lu Xing, see Henri Maspero, "The Mythology of Modern China," in J. Hackin et al., Asiatic Mythology, New York, 1963, 344-345. On the symbolism of the eight trigrams, see C.A.S. Williams, Outlines of Chinese Symbolism and Art Motives, 3d rev. ed., New York, 1976, 148-151. The exterior decoration is incised into the body and painted with famille rose enamels against a yellow background. Between the decorative borders are bats carrying double gourds in red, white, green, and aubergine enamels (the word for bat in Chinese is a homonym of the word for good fortune, fu). The green and yellow borders consist of stylized ruyi heads around the rim and lotus petals above the foot. The hexagonal wine ewer employs the colors yellow, aubergine, black, and two shades of green. 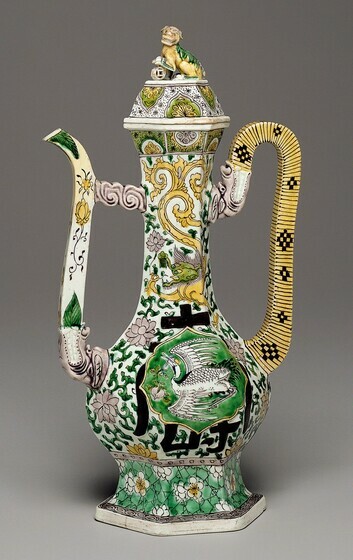 The primary motifs in the decoration are the large shou (longevity) characters on either side of the ewer, over which are superimposed ogival panels with the additional longevity symbols of a crane and a peach spray. Three-clawed dragons with split tails appear above the shou characters. These motifs are painted against a ground of floral scrolls. The foot is painted with white plum blossoms superimposed on a green cracked ice panel. Panels with stylized floral sprays surround the lip. A dragon's head appears at the base of the spout and at the top of the handle. The handle is painted yellow with black lines in imitation of basketwork. The lid is surmounted by a lion resting one paw on an openwork ball that spins freely. This ewer may have been designed as a birthday gift. A single four-clawed dragon encircles the vase, chasing a flaming pearl. Above the foot are painted crashing waves. The painting is executed in red, orange, and metallic gold enamels, with black for the dragon's eyes. This vase is a part of garniture of five porcelains that conforms to the standard eighteenth-century ideal in comprising three identical covered jars and two identical beaker vases.1 These sets were extremely popular in Europe as mantel decorations from the early eighteenth century onward. The vessels of this group share a mottled rose red ground that was blown onto the surface, probably through a tube with gauze stretched over one end. Isolated against this are medallions and cartouches in the form of leaves, fans, and scrolls. These have been covered with a transparent glaze in reserve and are painted with landscapes, birds, and flowers in opaque famille rose enamels. The colors include lavender, pink, white, black, turquoise, green, and metallic gold. Elsewhere on the surface are isolated chrysanthemums. Around the neck and shoulder of the vase are diaper bands with cartouches containing floral sprays. 1. A similar garniture is illustrated in Anthony du Boulay, Christie's Pictorial History of Chinese Ceramics, Oxford, 1984, 270, fig. 1. 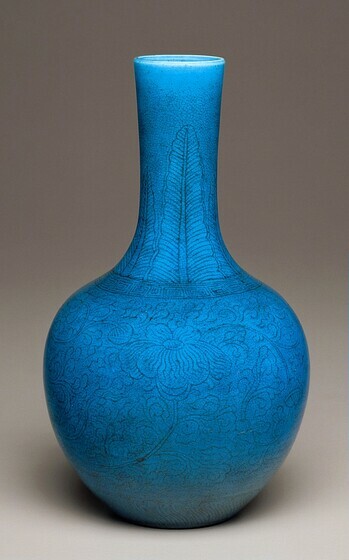 This bottle vase represents a shape of the late Kangxi period.1 It is decorated with a dense field of stylized scrolls that have opaque outlines enclosing mottled blue washes. The low foot is encircled by a narrow classic scroll. 1. 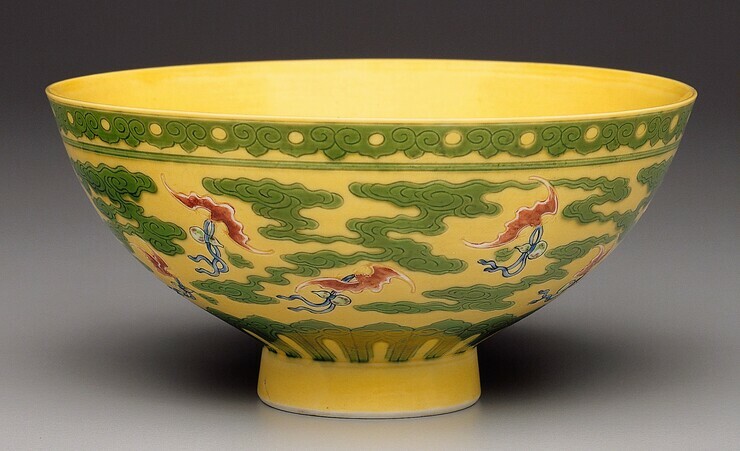 For a similar example, see Special Exhibition of Hsüan-te Porcelain of the Ming Dynasty [Exh. cat. National Palace Museum], Taipei, 1980, pl. 12. For an example in steatitic porcelain that has been dated to the late Kangxi or early Yongzheng period, see H. A. Van Oort and J. M. Kater, "Chinese Soft Paste or Steatitic Porcelain," Arts of Asia 12, no. 2 (March-April 1982), fig. 5. This vessel takes the form of a carp, its grotesque open-jawed head oriented downward and its tail raised. The tail is open at the end, forming the mouth of the vase. The porcelain was transformed from a vase into a pouring vessel or ewer for decorative use by the addition of a gilt-bronze mount made in France in the eighteenth century. The mount, in the form of scrolling vegetation, forms a base and high-rising handle. Both singly and in pairs, fish are a traditional Chinese motif in the decorative arts and painting. The carp is the species most often encountered. It is often found in ceramics of the Song and Yuan dynasties, and paired carp occur as a mark on the base of some Kangxi porcelains. Paired fish were one of the Eight Buddhist Emblems (or Happy Omens), and they also symbolize marital fidelity. A carp leaping from the waves is a subject appealing to the literati because it symbolizes the aspirations and struggle of the scholar for success in the imperial examinations. Jessica Rawson explores an interesting relationship of the monster-head fish with the Indian makara, a revered water spirit with a fish body and a fierce-toothed head. It is seen in early Buddhist caves at Ajanta in India. She illustrates decoration on late eighth-century Chinese silver and tenth-century Yue ware.4 Fancy fish were domesticated in China, as in Japan, but were unlike the Japanese koi. An expensive type was bred to have a grotesque face similar to the makara. In this vessel, vertical incised lines define the tail structure. The spine is raised, and overlapping scales are shown in relief on the body. A pronounced, protruding brow ridge, bulging spherical eyes, and a rounded nose characterize the monsterlike head. Beneath these, a gaping mouth dominates the lower third of the vessel. The upper jaw bears square teeth and pointed fangs, also in relief. The lower jaw, which is mostly covered by the mount, is decorated with an emanation of scrolls. A flamelike double set of fins sweeping back from the corners of the mouth is also partly obscured by the mount. The form of the enormous mouth allows for a wide rectangular base with rounded corners. The wide foot-ring is unglazed and brown, the base glazed. The pale blue, translucent celadon glaze has a soft luster and is finely bubbled. Where it runs thin over the relief elements, the pure white of the porcelain body shows through. The glaze on 1942.9.443 is slightly more blue and very slightly thicker than that on the companion piece. 1. One exists in the Earl of Harewood collection, Yorkshire, England; also D. F. von Lunsingh Scheurleer, Chinesisches und japanisches Porzellan in europäischen Fassungen, Braunschweig, 1980, fig. 332. Several such mounted fish are noted in eighteenth-century sales records: Sir Francis Watson, Mounted Oriental Porcelains [Exh. cat. International Exhibitions Foundation, Washington], Washington, 1986, 15; Sir Francis Watson, Chinese Porcelains in European Mounts [Exh. cat. China Institute Gallery, China Institute in America, New York], New York, 1980, 55, no. 30. One of the most important purchasers of mounted porcelain, Madame de Pompadour, is recorded as having bought 150 pieces at a single shop in a short period. See Christopher Hibbert, "The Tastemaker," Connoisseur (December 1985), 110-115. A photograph on page 110 shows one of her possessions, a mounted celadon fish similar to the San Francisco pair, now at Waddesdon Manor; Lunsingh Scheuleer 1980, fig. 333. 2. Fine Arts Museum of San Francisco, acc. nos. 1927.165 and 166; Watson 1980, no. 30, repro. 3. 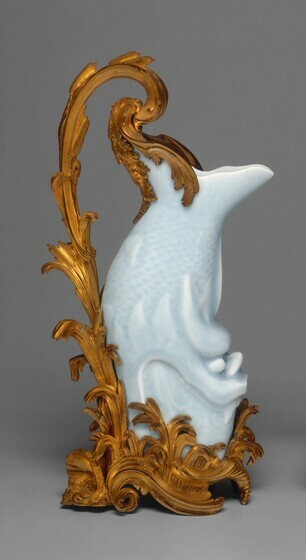 Examples of double fish joined at the belly, mounted as vases or ewers, include a pair in the Forsyth Wickes collection, Museum of Fine Arts, Boston, acc. nos. 65.2260 and 2261: Watson 1980, no. 23; and pieces in the Victoria and Albert Museum, London, and Walters Art Gallery, Baltimore: Lunsingh Scheurleer 1980, figs. 329 and 330, respectively. In Beijing, a Palace Museum example is illustrated in Kangxi Yongzheng, Qianlong Qing Porcelain from the Palace Museum Collection, Hong Kong; Beijing, 1989, pl. 141. 4. Jessica Rawson, Chinese Ornament: The Lotus and the Dragon, London, 1984, 114-116.